Instantly check for safe working capacity on any forklift! Call us at 843-532-6469 to check capacity ratings and/or get rating tags. www.LiftTruckCapacityCalculator.com is the world's first professional forklift capacity rating system available to all manufacturers, dealers, brokers or customers that addresses the need for fast and accurate capacity information necessary to properly determine a safe forklift configuration for a material handling application. An online forklift capacity calculator to instantly check the safe working capacity of any forklift with any attachment. OSHA compliant capacity rating data plates for configuration with any set of attachments. Professional engineering capacity certification for your custom made, in-house built attachments. OSHA compliant forklift data plates for in-house built forklift attachments. Corporate safety consulting for HSE, purchasing and engineering management. Capacity certifications for forklifts utilizing fork mounted attachments i.e. drum handlers, lifting booms, carpet poles and special devices. Capacity load map labels to establish safe lifting capacities for extension booms at multiple lift heights and load centers. Engineering & sales support for forklift manufacturers on forklift load capacity rating requests. Forklift engineering & sales support for attachment manufacturers on capacity rating requests. Engineering & sales support for dealers and material handling specialists. Are you looking for professional forklift engineering consulting company to certify your forklift load capacity ratings? You've come to the right place! At Lift Truck Capacity Calculator, you'll find an array of services including lift truck capacity calculator to help you verify ratings and provide OSHA compliant documentation. Now that you've found us, you have rapid access to calculate forklift attachment capacity and certify forklift data plates to help insure forklift operating safety in your facilities. With an array of features to address all of your forklift safety and OSHA forklift certification needs, you can count on Lift Truck Capacity Calculator for Professional Forklift Engineering Services. With our level of expertise and PE certification along with and top-notch forklift load capacity calculator service, you will find everything you need right here. Find out more about our features and services. Forklift Attachment Capacity Certifications - For all attachments including in-house built devices. Forklift Capacity Data Plates - For all makes and models, compliant with OSHA forklift regulations. Professional Engineering Calculations - Our calculations are based on software algorithms created by professional engineers to industry standards. Fast Equipment Configuration - Our online portal features drop-down menus for fast configuration. Get capacity rating information instantly without chasing down technical information or attempting play engineer and understand complex forklift capacity calculations. Feedback Features - Optimize forklift and attachment configurations for maximum capacity at the lowest cost. Make sure you have the right attachment for specific load handling conditions. Fork Wear - determine how fork wear affects forklift capacity. Make sure your forks are still adequate for the job. Manufacturer's Specification Sheets - Instant Access to forklift and attachment manufacturer's specification sheets. Easy to Use Capacity Calculator - our one-of-a-kind forklift capacity calculator is the world's first. A professional capacity rating system for all manufacturers, dealers, brokers and forklift owners / operators. You don't have to be an engineer or understand capacity calculations to use our Forklift Capacity Calculator. With our one of a kind approach to safety and capacity certification, you are sure to find what you need when you need it most. Let Professional Forklift Engineering Services give you access to the information you need to maximize carrying capacity while minimizing cost. Created and developed by the team at Professional Forklift Engineering Services, the Lift Truck Capacity Calculator is the best way to determine the capacity of your chosen forklift. The largest manufacturing companies in the world look to us for OSHA compliant forklift capacity data plates. Now that you've found Lift Truck Capacity Calculator, you can enjoy a completely hassle-free experience from start to finish. With just the click of a button, you will have access to our capacity calculator or just call us and we will insure OSHA compliance of your whole forklift fleet worldwide. Our unique forklift certification system puts forklift safety first, which will not only improve operations, but also allow you to maintain the safest workplace. When you're ready to find answers, we are standing by to help. There is no better way of accessing the capacity plate for the forklifts and attachments you need. Get started today and gain instant access to a one of a kind solution to your forklift certification needs. Get the answers you need right away. Should you need assistance at anytime, please contact us. 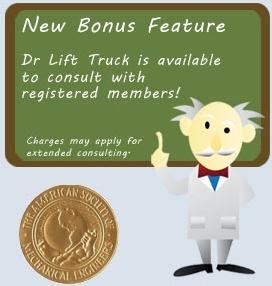 Call the Lift Truck Capacity Calculator team at 843.532.6469 or email Support@LiftTruckCapacityCalculator.com. We look forward to hearing from you and helping with your forklift capacity certification needs.